Florence’s historic center is cozy, and it’s easy and wonderful to get lost in the medieval alleys and winding side streets until you pop out unexpectedly on a main thoroughfare. Although packed with tourists in July and August, spring and fall bring some breathing room, allowing you to stroll leisurely through the city living la dolce vita! The number one thing I recommend is to climb the famous dome. For decades, this medieval church stood without a dome because no one could figure out how to span the enormity of the diameter. No one, that is, until the architect Brunelleschi came along, who designed an innovative construction method. When you climb the dome, not only do you get close to the ceiling paintings, but you actually climb between the inner dome and outer shell. The view over all of Florence and the Tuscan hills beyond is unparalleled. TIP: Get there early to avoid a long wait. 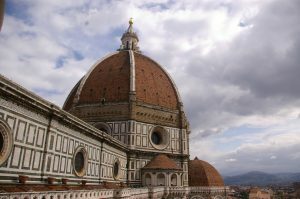 Before climbing the dome, however, go to the Opera di Santa Maria del Fiore. This small museum gives a great introduction to and history of the dome. Then on your climb, you’ll really understand what you’re seeing. Do you like art museums? Head to the world-renowned Uffizi Gallery to while away hours among sculptures and paintings by famous masters. 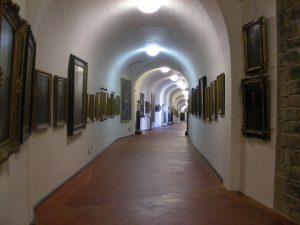 Buy a dual ticket for the Uffizi and the Vasari Corridor, a secret passageway that Cosimo de Medici used to travel between his office and palace (above the Ponte Vecchio) without ever going into the street where he could be attacked. Yes, he was a little paranoid, but as one of the richest citizens with political power, he definitely had enemies. 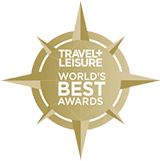 It’s only accessibly through a private group tour. If you want to forego the Uffizi, I’d instead go to the Museo Galileo, a history of science museum. Twice it was closed when I tried to go, once for a holiday and once for renovations, but I’ve heard it’s a great little gem, and it’s on my list for my next time in Florence. It’s easy to spend an afternoon wandering through the San Lorenzo Market. This is the biggest market in the city and a major tourist destination. Amidst the cheap, imported souvenirs, you can still find some good products, namely leather bags, sheepskin gloves, and handmade paper products. The further in you go, sometimes the better stuff you’ll find. The Mercato Centrale is about midway through the market. It’s an indoor food market with local and regional products where you can buy picnic items for lunch as well as things like buffalo testicles and sheep brains. For a truly unique souvenir, find Alice’s Masks Studio on Via Faenza a block west of the market. Alice and her father hand make and paint exquisite Florentine masks from traditional theatrical ones to fantastical beings. These masks are for display rather than dress-up. To see Michelangelo’s David, make your way to The Accademia. You’ll get your ticket, walk down the corridor towards David, it’ll take your breath away, you’ll stare at it for a few minutes, and then quickly look at the other stuff in the museum before you leave. Fun Fact: During World War II, David was completely entombed in brick to protect it from bombings, and it survived because of it. I also recommend strolling through the antique musical instrument exhibition. My favorite restaurant in the city is Ristorante la Maremma on Via Giuseppe Verdi just to the north of Santa Croce (home to the tombs of Michelangelo, Rossini, Galileo, and Machiavelli, and a unique wooden ceiling). Order the regional specialty: Pici con Ragu Cinghiali (pee-chee/ching-ghial-ee). Pici is a type of thick, handmade pasta, and cinghiale is wild boar, which is especially popular in Tuscany. This is basically fresh pasta with a tomato-based meat sauce. My favorite gelateria is Perché No! on Via dei Tavolini off Via del Calzaiuoli, the main road that connects the Piazza della Signoria to the Piazza del Duomo. Since 1939, they have made gelato fresh each day without artificial colors or preservatives. They have a wide selection of flavors including dairy free sorbettos. On your final evening in the city, walk to Piazzale Michelangelo at dusk, get there in time for the sunset and wait until the lights come on in the city. 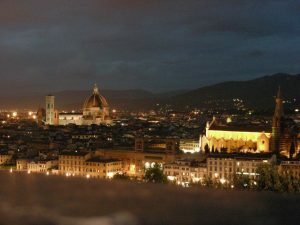 This is one of the best views of Florence and a perfect way to end your stay.